Who Wants To Go To Jay Cutler's ‘80s-Themed Dance Party? Everyone, of course! It's going to be awesome. There's going to be hors d’oeuvres and an open bar! Billy Ocean will be there! NFL fans will have the chance to revisit the iconic ‘80s with Jay Cutler and his bride Kristin Cavallari at Joe’s Bar on Weed Street on July 18. Don on your best ‘80s-inspired, brightly colored ensemble to this party benefiting a noble cause. This three-hour bash featuring an open bar, hors d’oeuvres, a DJ spinning danceable tunes and a special performance from Billy Ocean best known for hits “Get Out of My Dreams, Get Into My Car” and “Caribbean Queen.” The best part: 80% of the purchase price of tickets will benefit the Jay Cutler Foundation, which works to help both underprivileged children and individuals with diabetes. This is going to be a party sports fans (and all Chicagoans) will remember. 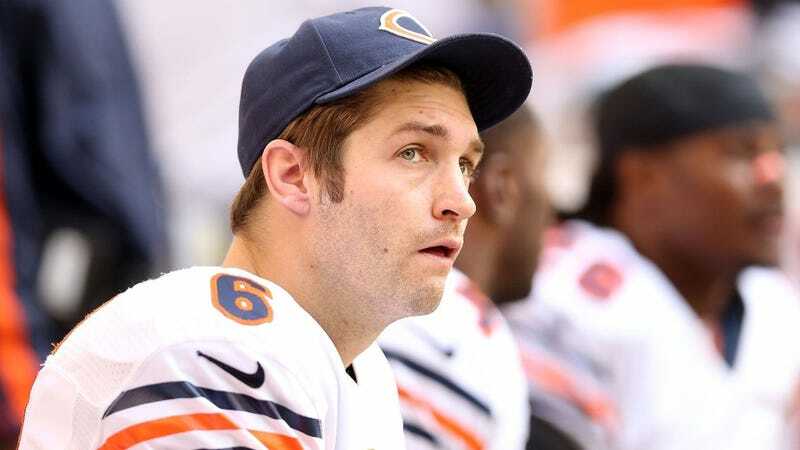 Honestly, an '80s party is probably the closest thing to his true habitat that Jay Cutler will ever find. Where else would a guy who is essentially a cross between Judd Nelson and Emilio Estevez's characters from The Breakfast Club be better suited spending his time? The party is in Chicago on July 18. If you happen to attend, please regale us with stories afterward. We will want to know all about Cutler's wardrobe choice.